Richard Morris of Nassington takes the boundary catch that won him a bottle of champagne. Photo: James Biggs photography. Close finishes were the order of the day in the Burghley Park sixes competition last night (July 3). Upingham’s 10 run-win over Market Overton was the biggest margin of victory in three first round matches. Pete Morgan hits out for Bourne in the Burghley Park sixes. Photo: James Biggs photography. 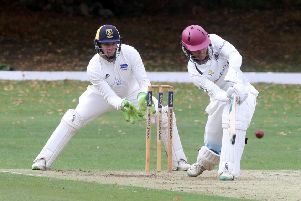 Bourne pipped Nassington by four runs, while Oakham beat Castor by three runs. Nassington’s Richard Morris won champagne moment-of-the-night for taking back-to-back boundary catches. Uppingham 89 (A. Ashwin 45, H. Butcher 21) beat Market Overton 79 (B. Makwana 45). Oakham 86 (J. Tattersall 51) beat Castor 82 (M. Wheat 24). The first quarter-final between holders Oundle and Barnack completes tonight’s (July 4) sixes action. That match will follow first round games between Ufford Park and Stamford Town, and Uffington and Newborough. Sixes action should start around 6pm.